Choose from our extensive menu of made from scratch, hand-crafted offerings and still make it out the door in time for work. 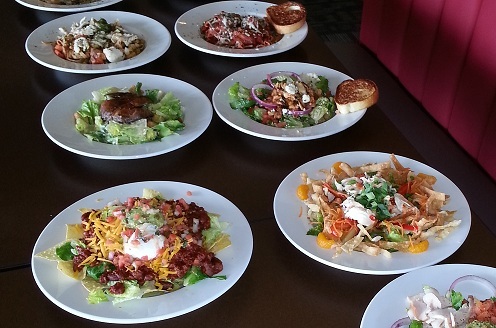 We take the time for fresh, delicious food so you don't have to! 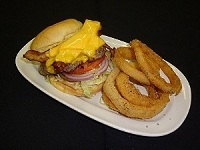 * Handcrafted onion rings, cheese frenchees & burgers just like the good 'ole days. * Dig into our prepared right here breakfast sausage or eat your fill of homemade buttermilk pancakes. * All our scrumptious, prepared salads offered on our 15-foot salad bar with over 50 items are scratch-made right here & never pre-packaged. * Enjoy one of our homemade salad dressings: 1000 Island, Ranch, Honey Mustard, or Blue Cheese. * Fresh baked croissants, cinnamon rolls, brownies, cream & fruit pies right here! * All our soups & chili are prepared from scratch full of homemade goodness & served every day. * We lightly smoke our own pork for tender, juicy pulled sammies or chops. * Only freshly prepared hummus & guacamole dips for our valued guests!